ArtRoomsGallery.com: "The Resurrection of Christ " Andrea Mantegna (1431-1506) Found! A painting that spent more than a century in the storerooms of a provincial Italian museum will be attributed Wednesday to one of the greatest artists of the Renaissance. The attribution to Andrea Mantegna (1431-1506) has the backing of Keith Christiansen of the Metropolitan Museum of Art in New York, the world’s leading expert on the artist. It means the painting, a wooden panel depicting Jesus’s resurrection, may be worth about a thousand times more than was previously thought: between $25 million and $30 million. The painting, titled “The Resurrection of Christ” belongs to the Accademia Carrara in Bergamo, a city about 30 miles north of Milan. In March, its curator, Giovanni Valagussa, was preparing a catalogue of works dating from before 1500 when he was struck by the excellence of a dark painting on a panel about 19 inches high and 15 inches wide. The work long ago had been removed from the museum’s permanent exhibition. Dismissed in the 1930s by prominent art historian Bernard Berenson as a contemporary copy of a lost Mantegna, it had been insured for €20,000-€30,000 (roughly $24,000-$35,000), Dr. Valagussa said. 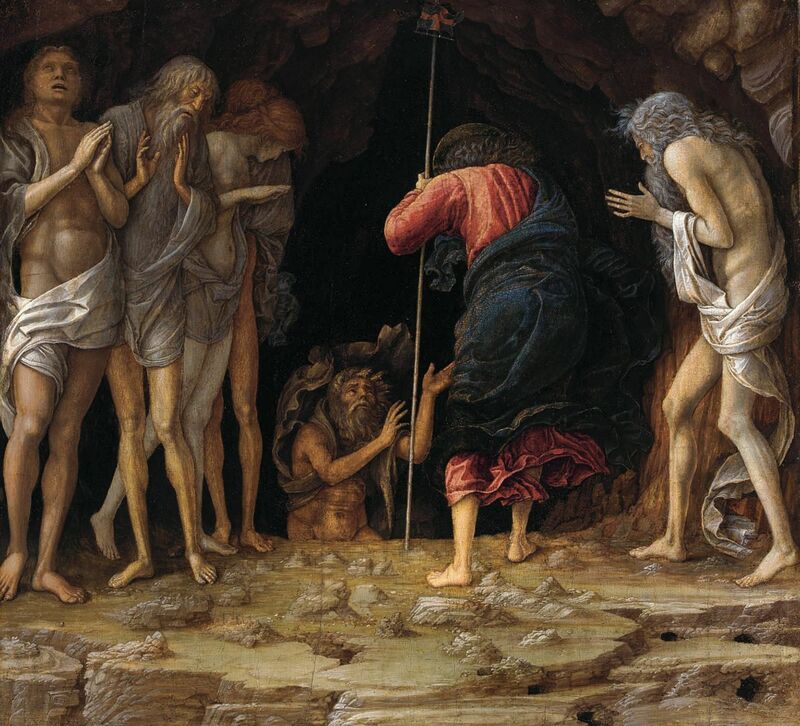 The painting newly attributed to Mantegna—'The Resurrection of Christ,' top —appears to have been separated from another painting by the artist, 'Descent Into Limbo,' bottom. The two paintings match up to show one large scene. MORE ON ARTA horizontal wooden strut on the back of the painting aroused his curiosity. Such lengths of wood often were attached to panel paintings, to help hold them together and prevent them from warping.“But usually they are found near the upper and lower edges,” said Dr. Valagussa. “This one was in the middle.”A detail of Andrea Mantegna’s painting, ‘The Resurrection of Christ,’ shows the cross at the bottom of the picture that proved a vital clue to curator Giovanni Valagussa. It struck him that the wooden bar might, in fact, have been near the top or bottom of a larger work of which the painting he was studying was originally a part. Painters and their works weren’t always given the respect they enjoy today, and it was common for early collectors to chop up panels, often to fit the spaces in which they were hung.As Dr. Valagussa examined the painting further, he noticed what was to become a vital clue: a small cross painted in gold near the bottom of the picture that was apparently disconnected from everything else. It was, however, identical to another cross at the top of the painting. This second cross was fixed to the end of a slim pole held by Jesus as he stepped from his tomb to the astonishment of a group of Roman soldiers.One possible explanation for the stray cross is that the panel had been cut to separate the cross at the bottom from a pole that continued into the rest of the hypothetical painting below. Dr. Valagussa set about looking for other works by Mantegna dealing with events following Jesus’s death on the cross.Meanwhile, he asked staff at the Accademia Carrara to carry out an infrared survey of the panel to see what was underneath the surface. They discovered that the artist had scrupulously painted fully dressed soldiers over drawings of nudes in the same positions.“This was something Mantegna always did,” said Dr. Valagussa. But it was also a device used by other artists of his time. What clinched the attribution was his research. Christian belief in the resurrection is associated with the idea of Limbo: a place for those who are stained with original sin, and thus cannot go to heaven, but who are otherwise deserving and shouldn’t be consigned to hell. Limbo, some medieval theologians reasoned, must have been where Jesus went in the three days between his death and resurrection to free the virtuous souls who had perished before him but not had the opportunity to be redeemed by his sacrifice.Mantegna painted the scene several times. Dr. Valagussa discovered one such depiction, firmly attributed to the artist, which also showed Jesus holding a flagstaff. If it were lined up beneath the cross at the foot of the panel in Bergamo, the stonework in the two paintings formed a continuous arch. The other work, titled “Descent Into Limbo” and completed in 1492-93, had come up for sale at Sotheby’s in New York in 2003—and fetched $28,568,000. Dr. Valagussa immediately wrote to Dr. Christiansen, whom he knew by reputation. The Mantegna painting at the Accademia Carrara in Bergamo is ‘an absolutely top-quality work,’ according to the Metropolitan Museum of Art’s Keith Christiansen, seen in Florence, Italy, in 2015. PHOTO: GETTY IMAGES“I did my own photo-montage and everything matched up,” said Dr. Christiansen, who said he saw no reason why the panel in Bergamo should not be worth the same as the one sold 15 years ago. For it to be a copy, it would have to have been part of a larger copy that was cut in exactly the same place as the original—a possibility so implausible he discounted it.The rediscovered Mantegna work was bought on the assumption that it was an original. Documents show that Count Guglielmo Lochis, a leading benefactor of the Accademia, acquired it in 1846 and catalogued it as authentic. A few years later, Sir Charles Eastlake, the first director of the National Gallery in London, saw the panel and had no doubts: “Mantegna … Resurrection – genuine – a small part added on left side,” he noted.His assessment was challenged by later experts. Giovanni Morelli, the 19th-century critic and father of the Morellian method for identifying the authorship of paintings through seemingly trivial details, was the first to cast doubt on the work’s authenticity. In 1912, it was attributed to Mantegna’s son, Andrea. 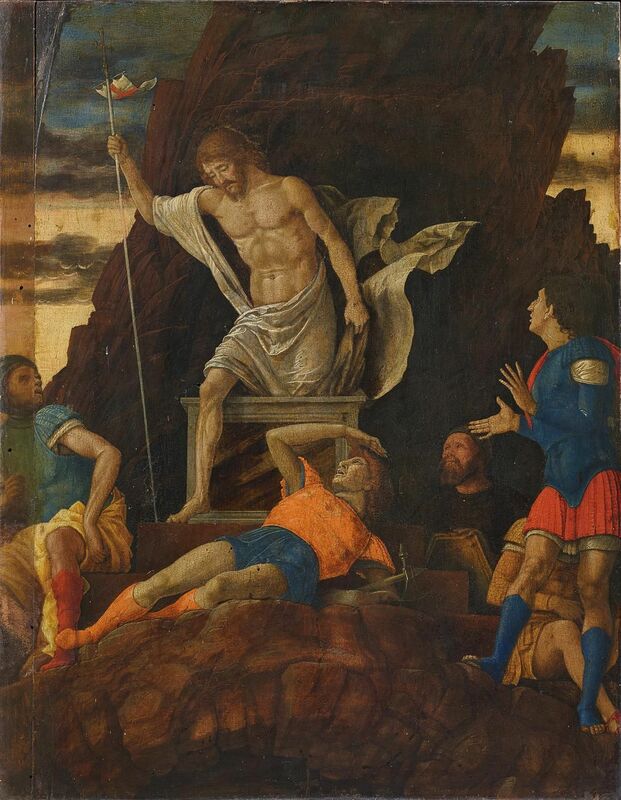 Mr. Berenson, who was revered by contemporaries as the world’s greatest Renaissance expert, ruled a few decades later that “The Resurrection of Christ” was not even from Mantegna’s workshop, but a copy. His judgment remained unchallenged until well after his death in 1959. Long before then, “The Resurrection of Christ” had been withdrawn from the permanent exhibition in Bergamo, likely due to doubt about its authenticity. It is missing from a list drawn up in 1912. Dr. Valagussa said work has begun on restoring the panel, which had been inexpertly conserved in the past. Already, he said, “Magnificent colors are coming out.” The painting’s attribution is to be announced Wednesday at the presentation of the curator’s catalogue of early works in the collection.The museum is hoping to reunite the two parts of Mantegna’s painting for an exhibition next year. Dr. Valagussa said that, through Sothebys, it had made contact with the private buyer of “Descent Into Limbo.” But the collector was “not someone who likes to be disturbed,” said Dr. Valagussa, so the other half of Mantegna’s work might not be made available. Despite new scientific techniques and technology, art authentication remains a subjective, often contentious, practice. No universally recognized global clearinghouse examines every disputed painting and decrees whether it is a Mantegna, for example, or a Michelangelo—or neither.“It’s really artist by artist and period by period,” says Michael E. Salzman, general counsel of the law firm Hughes Hubbard & Reed in New York, who has worked on authentication matters.A working artist—and perhaps his or her gallery—usually can say whether a work is genuine. The issue gets more complicated when the artist is no longer alive. In at least some European countries, the artist’s family inherits the right to declare his or her works genuine or not. The Picasso family, for example, is empowered to authenticate the Spanish artist’s works. In the U.S., that legal right extends only to the artist—and usually ends with his or her death, with a host of variables depending on when a work of art was created. The estates and foundations of some deceased American artists authenticate their works, even though the practice can expose organizations to litigation. In the past decade, a number of U.S. artists’ foundations and estates, including those of Keith Haring, Andy Warhol and Jean-Michel Basquiat, ceased authenticating works for others. Some experts’ reputations suffered after Knoedler & Co., a pillar of the American art scene for more than 150 years, announced in 2011 that it was closing. Between 1994 and 2008, the New York gallery had sold more than 30 paintings that it subsequently learned were fakes. The works, which had been vouched for by experts, were counterfeits of Jackson Pollock, Mark Rothko and others. Academics, curators and other art-world sleuths enlist a range of tools in attribution, says Andrew Butterfield, a scholar and dealer who has authenticated works by Donatello, Bernini and others. These include technical and scientific analyses, such as examining the pigments in paints or the metal hardware and original carpentry on a panel painting. There also is visual analysis, which has become more powerful and precise thanks to developments in photography over the past 20 years. “You can take macro photographs and compare things that are on an extremely fine level, point by point,” Mr. Butterfield says, “as well as taking a more overall view of one painting in relation to another.” Collaboration often plays a role. “It’s very rare that it’s just one person making an attribution by themselves, a lone individual,” Mr. Butterfield says. That can happen but more often it’s “the result of an exchange of ideas and thoughts among colleagues.” Connoisseurship—the expert’s trained eye and aesthetic—also informs judgments. Provenance, or history of ownership, can be useful and isn’t restricted to recent works, says Mr. Salzman, citing a case where records from 17th-century Italy helped to cement an attribution call. Some attributions are done swiftly but many are gradual, deliberative affairs, involving back-and-forth of opinions among experts. “Even if you have an idea: ‘Oh, this is by—name your favorite artist,’ ” Mr. Butterfield says, “You would be an idiot to not then test that as thoroughly as possible, ….look for the weaknesses in the argument and try to disprove the idea.